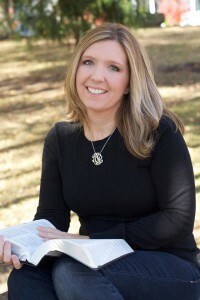 It’s a joy to welcome Linda Kuhar to the blog today. I am inspired by her story and her perseverance. This woman? Just wow. Linda survived Stage 3 cancer and a coma resulting from a compromised immune system during cancer treatment in 2009. Although doctors predicted she would never walk or breathe again on her own, she proved them wrong. And she’s right here, today, bringing a powerful story and details about her brand new book. Join me in welcoming Linda to the blog. I get chills thinking about those fearful words the doctor spoke to me six years ago. My husband, nine-year-old daughter and I were still grieving from the loss of my sweet mother-in-law who had endured a horrific four-year battle with cancer. I, too, was in for the unexpected fight for my life. In May 2009, I was diagnosed with cancer, Stage 3 Hodgkin’s Lymphoma. I started chemotherapy right away and within five months of treatment I became ill and was hospitalized. The doctor told me that I just needed to build up my immune system and it would only take a couple of days before I would return home to my husband and little girl. Those few days turned out to be one month in a coma on life support with less than a 5% chance of surviving. The doctors told my family that if they believed in divine intervention, it was time to ask for it because they did not think I would recover and “if” a miracle happened, I would be in a wheelchair and on oxygen for the rest of my life. Family and friends gathered in prayer asking God for a miracle, and by His grace that – is exactly what He gave us. Not only did I wake up from my coma, but I had a full recovery. One year later, I ran my very first half marathon with Team In Training for the Leukemia & Lymphoma Society and became a Christian life coach and speaker. As I shared my inspiring story over the next couple of years, I began struggling with my worthiness – something that was buried deep within me my entire life. But now there was no more hiding the struggle of constantly feeling “not enough” … the blaring spotlight of sharing my miracle story final caught up to me and I could no longer ignore it. Why did I deserve to live? Why did the little girl in my neighborhood lose her battle to cancer and not me? My mother-in-law was a much better Christian than I was, so why was I still here? Shame and “not good enough” thoughts consumed me and I began to question if I really believed in God. I needed an even bigger miracle: the faith to believe I was worthy of God’s unconditional love for me. My newly released book, Worthy of a Miracle is not only about my physical healing but my spiritual healing and how I discovered my true worth in Jesus. It is a guidebook for any woman who wants to more fully own her inheritance as a daughter of God. And it is for you, no matter where you currently are on that journey. It is not a step-by-step instruction manual on how to become “worthy,” but rather an inspirational practice to deepen your awareness of how worthy you already are by accepting the relationship Jesus offers. Over the years I learned how to use an acronym as a simple reminder of how to live in the truth about my worth and relationship with God. 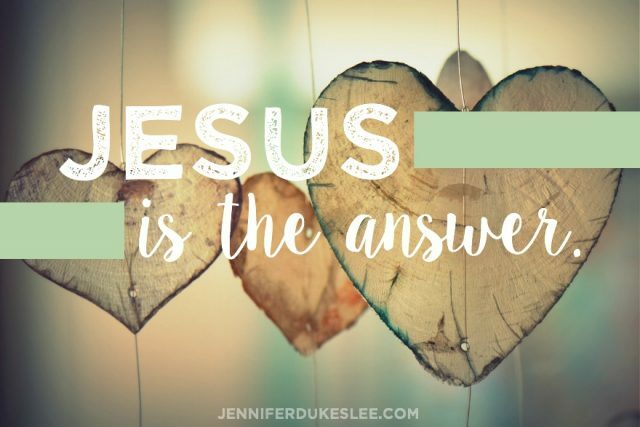 To walk you through your own shift in perspective about how worthy you are, I share with you the most important lesson I’ve learned along the way: Jesus is the answer. I’m thrilled to be giving away TWO copies of Linda’s new book. To enter, simply leave a comment on this post. 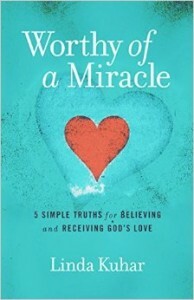 Linda Kuhar is the author of Worthy of a Miracle. You can watch the book trailer here. Linda is a Certified Christian Life Coach with Christian Coach Institute and has led women worldwide through online Bible studies. A wife and mother, Linda survived Stage 3 cancer and a coma resulting from a compromised immune system during cancer treatment in 2009. Although doctors predicted she would never walk or breathe again on her own, she proved them wrong. One year after awakening from her coma, she ran her very first half marathon with Team In Training for the Leukemia & Lymphoma Society. What an incredible story! Jesus IS still in the miracle business! What a powerful story! And what beautiful encouragement to hear how God used a miracle to birth such a heart transformation. I’m being led through this myself at the moment, so am really interested in reading Worthy of a Miracle. Thank you for sharing this, Jennifer. Wow, Linda – just wow! Thank you for reminding us just how BIG our God is and how very much He loves us. I have the privilege of living with a miracle man who survived stage 4 non-Hodgkin’s Lymphom with central nervous system involvement (I always joke that it ‘went to his head’). He’s known as the walking miracle at the hospital where he received treatment :). I love how God can use our stories to encourage and strengthen others. Wow Anita 🙂 I love hearing other miracle stories!!! Thank you Jesus!! What an incredible story. God is so good. I can’t wait to read this book! Linda, your testimony amazes me, and that J.E.S.U.S. acronym is pure gold. Thank you so much for sharing it. Gotta write that down. Jennifer, thanks so much for opening your doors to Linda and the #TellHisStory gang! Thanks for sharing this amazing story of God’s healing both physically and spiritually, and I love the acronym- definitely good advice to remember. What a powerful story. Lately I have had so many around me be diagnosed with cancer. Your story and miracle give me hope for them and so many battling cancer. Thank you for sharing your story with us. Tara praying with you today for those who are battling cancer as well as for their care givers. Wow! What an incredibly inspiring story. Thank you for sharing your miracle and that fantastic Jesus acronym. I will definitely memorize that for future reference :). Many blessings to you, Linda! What a beautiful and inspiring story! So glad you rely on your worth in Christ and share the gift with women everywhere. Thank you for your precious words. The Jesus acronym is going on my wall! Blessings. Very Inspiring story! I am grateful for your miracle, Linda. I am in awe of our God who not only heals but proves over and over how much He loves us. Your story is one of grace, coming from behind and an absolute worthiness that you deserve to be where you are right now. Thank you for sharing this story with all of us. What a beautiful testimony of God’s healing power! A miracle for sure! So much hope presented in this blog post. God bless you for sharing it with the world to testify of God’s mercy, power, forgiveness, etc. Beautiful story!! It’s amazing that the sickness didn’t teach her she was worthy. That is what makes her story so special. Reminds me also of Gods grace. I love the JESUS acronym!! Jennifer thanks for hosting the linkup each week too!! Thank you God for your amazing Grace. Beautiful testimony! Oh yes, I would love to learn, too, to be worthy of a huge miracle! This is such a passion of mine! Reminding people that they’re worth something, including the girl in the mirror. She forgets sometime too. I would love to win one!! Thank you Lori! We are worthy!!!! Claim it. Speak it. Thank you Jesus! WOW! Awesome, inspiring story. Thank you for the opportunity to win a copy of your book. I and so many others struggle with this very issue….am I worthy? Blessings to you and yours. It always amazes me how God shows His glory through ordinary people going through the fire with Him. God needs an honor guard now, too, people who will just say yes and use what they have been given to point like a signpost arrow to Him with all that they are, all that they have experienced, and all their suffering. I needed this hope today. Amazing story! Love how He does what He does! Beauty from Ashes! Thank you for sharing. My mom just went through cancer treatment for Lymphoma this year. It was rough on her but her recent scans say she is cancer free. What a journey! I admire strength. Blessings! Praise God Rachael for your mom’s health report!!! That is awesome!!! What a beautiful story, Linda, and thank you for speaking truth to this powerful lie that we are unworthy. Amazing! Thank you, Jennifer, for sharing this inspiring story here. What an incredible testimony to the Lord’s love!! Thank you for sharing Linda and Jennifer. What a wonderful & inspiring testimony! A reminder of God’s faithfulness & power to each of us, the least. Blessings! Thanks so much for sharing, Linda. Just wow. I struggle sometimes too with how God chooses who to bless with a miracle and who not to. Its a tough subject. One I doubt I’ll ever understand this side of heaven. But he chose to save me and forgive me. His grace is sufficient for me. I was in tears as Linda describes that she felt she wasn’t good enough. I have been struggling with the same issues. I would love to win one of her books. God Bless you Linda! Lifting you up tonight Connie! Believing you will find and embrace your worth like never before. You are worthy!!! I do not deserve my husband – I am a fallen woman but I serve a gracious loving Father who has blessed me abundantly and I choose to praise & thank Him for His gift. My Father adores me and truly this IS HIS plan for marriage so I will not only be content BUT I will rejoice in His goodness to me. What an amazing story! Personally, I have felt non-deserving as well, and it was a blessing to hear how one person went through the same feelings and emotions, only to be closer to the Lord than ever. Would love to win her book. Such an inspiration! Oh, what a story! 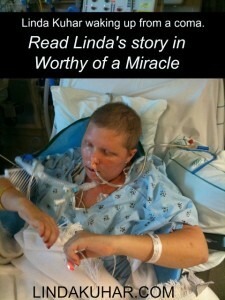 Linda, I praise God for your healing, for the tenacity that is so evident, for the glory that is His. Who better to press forward, singing His praises and telling of His wonderful works than you? It is good. You’re an inspiriation…and I haven’t even read the book yet! Can’t wait to get my fingers on it. Thank you Kristi. I like that word “tenacity” …. it was a long journey but I’m so grateful I pushed through and completed the task. All glory to God!!! Oh my goodness – this message hits me right between the eyes today. I’ve been struggling with feelings of unworthiness my whole life but only lately have I really discovered that this feeling is the nagging feeling that has been buried within me for so long. Now I’m just trying to deal with this realization and figure out a way out. What an amazing story and an amazing testimony of discovering one’s worth. I look forward to reading this book. What an amazing testimony to God’s goodness! Linda, thank you for sharing your story with us. Very powerful testimony! Wow. You have such an inspiring story. A hard to story to live through, I’m sure. But so very inspiring. What an encouraging and faith-building post. THANK YOU. Such an amazing testimony of God’s love and grace. Thank you, Linda. Also for being so open about feelings of “not enough.” Something I especially struggle with. I love how you remind us that Jesus is the only answer. In Him we are worthy. I’m so happy you are still here and are using your pain for His purpose. Thank you Trudy. That is the heart of my message to open up a conversation about those “not enough” feelings and expose those lies. What a glorious, powerful story! Thank you, Jennifer and Linda. If we can just get that message inside of us – and share it with others – oh, the lives that will be changed. So very thankful you are sharing this message! Amen! We are worthy. Thank you Jesus! What an amazing miracle testimony! Wow! I love that message. Many of us have been struggling with our worth because the world could be really cruel. Good thing Jesus never fails to remind us.